Safe working load signage alerts users to check the capacity of their wheels. All load-bearing components have their limits—including industrial wheels. It’s important to understand a few working parameters before determining the suitability of any metal wheel. Wheel failure can result in serious harm to working staff or bystanders. A poorly planned wheel assembly can also shut down operations, causing unnecessary delays and the need for repair. Before looking at the specifics of load capacity for steel wheels, we need to consider the differences between two types of loads: static and dynamic. A static load is one that does not change in magnitude or direction. This is a load at rest—fixed and stationary. An example would be a shelving unit stocked with products in a storage area. The shelving unit is not moving, and the load is not changing at any given rate. 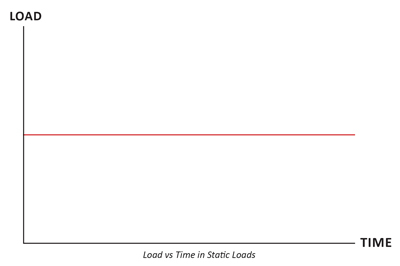 As shown in the graph to the right, static loads remain constant, regardless of time. A dynamic load is a load that changes either in direction or magnitude, or both. It is a moving load that is never stagnant. An example of this is a bus moving along a bus route. It’s in constant motion and the load is changing with the passengers getting on or off the bus at each stop. 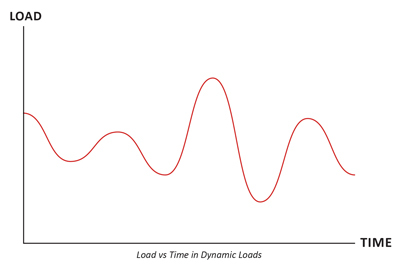 As shown in the graph to the right, dynamic loads are always changing with time. In order for wheels to serve their purpose of transporting goods, they cannot be fixed—they must be moving, with each wheel turning a full 360 degrees. Therefore, wheels carry dynamic loads. It’s important to note that speed is a significant factor to consider when understanding requirements for safe operation of dynamic loads. A dynamic load traveling at high speeds will experience some degree of vibration and impact, and requires wheels that can sustain material fatigue to operate safely. A dynamic load traveling at slow speeds will experience smoother operation and little to no vibrations. Reliance Foundry wheels are not designed for high speed operations, and are fit for use on slow speed operations with a recommended speed of 3 mph or lower. A safe working load is the maximum mass that a product can carry without breaking. Safe working load ratings are typically determined by manufacturers to identify the limitations of their products. When evaluating industrial wheels, a product can be expected to fail if loaded beyond its safe working load. Double flanged wheels, such as the cart wheel pictured here, offer high load capacity. All Reliance Foundry heavy duty wheels are designed, manufactured, and evaluated to a specific load rating. The following method for evaluation takes into account wheel applications for a cart or other vehicle bearing an equally distributed load while at rest. Vehicle loads must be considered per wheel. It’s also important to include a safety variable for any unforeseen circumstances. We recommend a minimum variable of 25 percent—which does not take into account additional factors discussed below. For applications where human safety is an issue, this safety variable may need to be much higher. Identify the total weight of the vehicle and its maximum load. Add an additional 25 percent of the total weight to allow a margin of error. Divide the total weight, including the additional 25 percent, by the number of wheels supporting the cart. The resulting number must be lower than the safe working load of the wheel being used. According to this calculation, this vehicle will require each wheel to have a safe working load greater than 3,125 lbs. When evaluating industrial wheel products for a specific application, it’s important to take into consideration all possible factors that will affect performance. Potential factors are listed below but a professional engineer is needed to determine specific requirements for any metal wheel application. Single flanged wheels, such as this one, can also carry a large load. Load size and distribution: Loads can vary not just in mass, but also in volume and placement. Uneven placement may increase the force applied to certain wheels, and loads may shift during transportation. How materials are loaded into a vehicle can also increase the amount of force applied to a wheel, both vertically and laterally. For example, safe working loads assess downward forces —those resulting from gravity—and do not consider horizontal or lateral impacts. Loads placed at higher velocities—dropped from above or from an angled spout—will exert more force than a load at rest. Vehicle operating speed: Safe working loads are assessed for wheels at rest. Vehicles traveling at speeds exceeding 3 mph should take this into account when assessing the suitability of a specific wheel product. Frequency and duration of use: All materials wear with regular use; metal wheels may also deteriorate quicker in adverse conditions. Safe working loads don’t take into consideration the wheel’s use over any period of time. Be sure to consult a professional to determine how long a metal wheel will last before it needs to be replaced. Alterations: Any alterations performed on a heavy-duty wheel will affect its performance. Reliance Foundry’s safe working load ratings apply only to wheels without any alterations. Environment: Environmental factors may include hot or cold temperatures and/or exposure to corrosive substances. Extreme temperature variations can affect the performance of industrial wheel materials, and corrosive substances can compromise a wheel’s integrity. Safe working loads are determined for industrial wheels under normal operating conditions— free of corrosive substances and operating at room temperature. Track conditions: Track conditions can affect the wear and operation of metal wheels. Tracks that are skewed or subject to significant vibrations can affect load capacities and may result in excess wear. Worn track surfaces, debris, and a track’s material composition can also increase the rate of deterioration. Don’t see what you’re looking for in our standard, in-stock products? Reliance Foundry will design and manufacture custom industrial wheels for specific applications. Full customization services include consultation, design, prototyping, manufacturing, and shipment. Our experienced design staff is available to help identify the most suitable materials, pattern designs, and manufacturing processes to ensure the best value and performance based on intended applications and volume requirements.